These cheesy balls of delight is something I've made quite a few times over the past two months. Mostly as a way to plough through the mounds and mounds of spinach I receive in my veggiebox, but also because it's damn delicious. I decided to do something different this time and with the help of the four lonely tomatoes lurking in the vegetable drawer, this tomato sauce was born, loosely based on one I saw on Smitten Kitchen a while ages ago. You wouldn't think that the simple combination of tomatoes and butter would be so fabulous, but it truly is. And to then team it up with cheesy spinach dumplings? Why that's just asking for trouble. I call these gnudi, but they're actually just plain old spinach dumplings with a bit of added cheese. Gnudi is a fancypants Italian way of basically saying "dumpling" and normally contains fancypants Italian cheeses such as ricotta and parmesan. When you're living on the southern tip of Africa though, those will set you back quite a bit, so it's not something you'll regularly find in my fridge. I improvised with the cheese I did have on hand - cheddar - although it work work equally well with any firm cheese, I imagine. They come together very quickly and are quite filling so you don't need a lot, although if you're anything like myself and TheHusband, you'll polish the entire batch in one go between the two of you. Erm. Well, we're heading for winter after all and we need that extra layer of fat! At least, that's the excuse we're most fond of. *A girl can dream, right? 1. In a large saucepan with a little bit of water, gently steam spinach over medium-low heat, covered, until wilted. Drain, squeezing out as much water as possible, then finely chop using scissors or a food processor. 2. 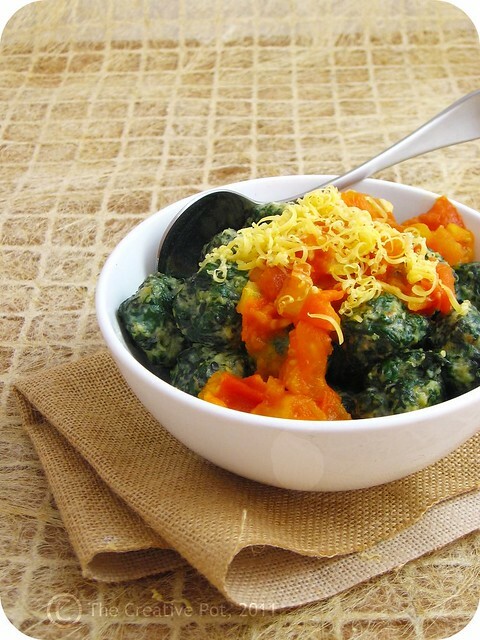 In a medium sized mixing bowl, combine the chopped spinach, eggs, cheese, salt, paprika and flour to form a slightly wet batter. 3. Meanwhile, bring a fairly large pot of salted water to the boil. Form spinach mixture into small rounds, using floured hands and coating each little ball in flour before dropping into the pot of boiling water. Cook a few dumplings at a time, removing them with a slotted spoon when they rise to the surface. Repeat until there is no more of the spinach mixture left. 4. While you're busy cooking the dumplings, prepare the tomato sauce by heating a knob of butter in a small saucepan and then adding the tomatoes. Cook over medium-high heat, stirring once or twice to form a thick, chunky sauce. Taste and adjust seasoning. 5. When all the spinach dumplings have been cooked, briefly fry them in a small amount of butter or nut oil of your choice. Spoon into serving bowls, top with tomato sauce and a sprinkling of grated cheese and enjoy. If you are calorie conscious, substitute the cheddar or gouda with a low-fat hard cheese and omit the frying at the end. For those of us who aren't counting calories, you may want to skip the tomato sauce altogether and serve the dumplings with melted butter, crispy onion rings and a dusting of smoky paprika - delicious! Looks deliiiiicious :) Sounds like a perfect winter dinner! I love that these are predominantly boiled dumpling style, and not all-out deep fried fritter style. Comfort food is a whole lot more comforting if you know it's somewhat healthier! LOVE that you boil them and don't need vats of oil. I have a giant spinach plant that requires an urgent harvest and now I have the recipe to use it all - delicious!! What a brilliant and original meal. Not sure I could get my hubby to eat this as an entire meal but it's worth a try. Mmmmm I wonder if I can try them with meat...we need the extra layer of fat right? lol! Nice photography! @Thuli Give it a go and lemme know how it turns out!